The Master of Fine Arts in Acting is a three-year professional training program that prepares actors to excel in a competitive marketplace. You will learn both time-tested techniques and the latest trends in contemporary actor training within the context of a faith-based curriculum. Receive in-depth training in the Meisner Technique, stage fighting and screen acting. Explore principles of auditioning and navigating the business of acting, from headshots and resumes to interviewing. Perform your major thesis role in a mainstage production during one of your final two semesters in residence. Enhance your professional credentials with an MFA degree. Analyze texts for film, television, or theatrical production. Apply the Meisner technique in your acting. Apply both, aesthetic and safety principles involved in combat for stage. Demonstrate a deeper understanding of acting in periods and styles, voice and movement, and screen acting. Opportunity to gain expertise in designing and applying a variety of makeup techniques including: corrective, fantasy, animal, special effects, old age and will culminate in the introduction of latex prosthetic pieces. Student will be required to purchase a personal makeup kit. Meisner’s approach trains actors to get out of their own heads and into reading the behavior generated by their scene partners. It accepts as a basic premise that actors build each others’ characters, moment by moment, together. The course will explore, in some depth, such Meisner exercises as: “The Reality of Doing,”, “Point of View,” “Pinch and Ouch,” “What’s Happening,” “Working Off,” “Coming to the Door,” “Doing Fully,” In the Extreme,” “Taking It Personally,” “In Relationship” and “Raising the Stakes.” This course will take as its focal point exercise work as opposed to intense scene study. Any scene work will be drawn from contemporary dramatic literature. A continuing study of Sandford Meisner’s Approach to actor training. Focuses on preparing the actor to access and control release of emotion. Exercise work includes: “Setting the Stage,” “Emotional Preparation,” “Coming Home to Be Alone,” “Coming Home to Do,” “Roommates,” and “The Highest Stakes.” Acting 2 has a more demanding scene study component than Acting 1. Scene work will draw upon the dramatic works of Henrik Ibsen and Anton Chekhov. Aesthetic/safety principles and practical techniques utilized in the staging of unarmed combat and medieval broadsword for the stage. A healthy environment for integrated voice and movement work utilizing a psycho-physical approach, including tension/release, proper alignment, centering and breath work, economy of movement and freedom from habitual limitations. Expressive cycles in the physical life of the actor, including kinesthetic awareness, expressive continuums, integrated breath cycles, physical properties of expression and character energies. Prerequisite: THE 715. Major performance dialects utilizing the International Phonetic Alphabet, ear training and healthy principles of vocal mechanics. Prerequisite: THE 715. Practical application of integrated voice and movement training to a range of play texts, focusing on the synthesis of kinesthetically-based techniques. Prerequisite: THE 716. Introduces a variety of safety/aesthetic principles as well as practical techniques utilized in staging Renaissance sword fights for the stage. Principles covered include: distance/measure, partnering, cue-reaction-action, masking, reversal of energy, and the pyramid of safety. Techniques covered will be drawn from the following categories: footwork, cuts, thrusts, parries, cross parries, hand parries, reinforced parries, direct and complex attacks, prise de fer (taking of the blade) attacks, avoidances, dagger attacks, combining unarmed techniques with blade work. Utilizes the concepts of “practical aesthetics” to further solidify the advanced actor’s application of objective-driven acting technique to scene work. Drawing heavily from the work of the Atlantic Theatre Company, this course proposes practical solutions to balancing pre-production analysis (intellect) and spontaneous, moment-to-moment discoveries in performance (intuition). Course concepts are applied to an intensive scene study, primarily in contemporary theatrical literature. Intensive scene study applied to the texts of major twentieth century playwrights whose works present unique challenges for the contemporary actor. Prerequisite: THE 728. Designed to teach the techniques and methods of screen acting for single-camera productions (although multiple-camera productions are also addressed). Students are required to prepare and perform scenes for presentation in class, to actively participate in classroom exercises and discussions, and to perform as on-camera talent for student productions outside of class in conjunction with other Film and/or Television classes taking place at Regent University. An advanced-level acting course for on-camera performance. Students are expected to already have a basic knowledge of and experience with the unique requirements of screen acting. Students should already be able to adapt the level of performance to various types of camera shots. The class builds on this base knowledge and concentrates on intense scene study to isolate and target those specific moments that define and shape believable, artistically appropriate on-screen performances. The course also focuses on commercial and professional scenes. Provides the advanced actor with the various facets of approaching Shakespearean dramatic texts. An emphasis is placed on scansion, voice quality, builds, playing through lines, and finding a physical and emotional subtext for the language. Work is memorized from Sonnets, soliloquies, and dramatic scenes both serious and comic. An ensemble and individual work in vocal dexterity and sensitivity is also applied. Focuses on the drama and performance styles of the theatre of Ancient Greece, Neoclassical France and England, the Commedia dell’ Arte of Renaissance Italy, and Theatre of the Absurd. Students are introduced to the cultural milieu of each of the above-mentioned historical periods and the theatrical conventions in force at that time; and participate in a variety of exercises designed to immerse him/her in that particular period or style of theatre. Each student performs scene-work drawn from dramatic literature written during each of the abovementioned periods or styles of theatre or drama. Work with Greek and Commedia dell’ Arte mask is also included. Variety of approaches to auditioning examined: the prepared audition, cold reading, and improvisation. Students work on a series of audition pieces so as to have a polished repertoire available upon completion of their degree. 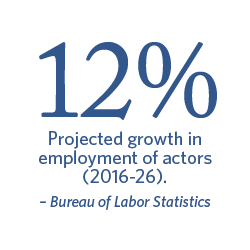 Course covers the tools necessary for an actor to market themselves, including head shots, resumes, cover letters, interview technique, and finding “survival” jobs while maintaining a career as an actor. Affords students the opportunity to accrue academic credit for acting in Mainstage and/or studio productions. Acting/Directing students may earn these credits for directing Mainstage and/or studio productions. Students may register for this course to fulfill elective requirements. Pass/No Pass. MFA Acting students perform a major role in a Mainstage production during one of their final two semesters in residence. MFA Acting/Directing students direct a full-length production. This creative project includes a written component, or thesis, requiring research, analysis, and clear evidence of application. Pass/No Pass. An audition is required for those interested in the MFA in Acting prior to beginning the admissions process. View audition dates and requirements. Once all auditions are completed, individuals will be selected by faculty to join the program and letters of invitation will be mailed. If you receive a letter of invitation, you may continue with Step 2 below. For those invited into the MFA in Acting program the $50 application fee is waived. Invited candidates are encouraged to email comadmissions@regent.edu when the application is submitted and the admissions team will process an application fee waiver on your behalf. In lieu of the previously required writing sample, please complete a brief admissions questionnaire based on your professional goals and interests. This should only take a few minutes to complete but please answer the questions completely and thoughtfully. This gives us a better opportunity to get to know you and align your objective with our programs. The admissions questionnaire can be found here. Once completed, it will be sent directly to an enrollment counselor who will be in touch with you right away to help complete the rest of your application. Provide a theatrical resume of theatre/film/television roles and production history. Email to apply@regent.edu using the subject line: SCA Master's Application Pieces or fax to 757.352.4394. Professional or Faculty recommendation forms may be submitted as supplemental items, but are not required. "God provided Regent University as a place of revitalization, equipping and waiting upon the Lord. I'm very grateful to the faculty and staff who gave of themselves to make Regent such an amazing place to learn."